Nandor Gallas, hungarian sculptor and graphic, was born in Temesvár on January 21st of 1893. After finishing at the School for Wood and Metal Crafting of Temesvár, he continued his studies at the Hungarian Academy of Applied Arts as a student of Imre Simay, Lajos Mátrai and Géza Maróti. After graduating, he continued working here as a teaching assistant until the beginning of WWI. He served as a soldier for a year. His service was followed by russian captivity. He tried to escape a few times and had numerous different jobs in the next few years. After this, he studied sculpting at Moscow University for two years. He also participated as a drawer in an ethnographic scientific expedition in North-Siberia. In 1921 he returned to Temesvár, and in 1922 he held his first independent exhibition. His works include wooden and stone statues, gypsum figures, and plaques. He worked on porcelain for a while as well. In 1922-23 he went on an educational trip to Dresden and Munich. In 1928, a few of his bronze statues were cast in Bukarest, and he had another successful individual exhibition that year. Between 1924 and 1927 Gallas worked on the frontages of quite a few public buildings in Temesvár. Many towns ordered their monuments for the memory of their soldiers lost in WWI from Gallas. He also created tombs for the wealthy families of Temesvár. His drawings were published as illustrations in several literary and artistic journals, such as Pásztortűz, Erdélyi Helikon, Temesvári Hírlap, Analele Banatului, etc. From 1925 he published avantgard literary writings, pictures of his sculptures and russian translations in the literary and artistic journal of Arad, called Periszkóp. 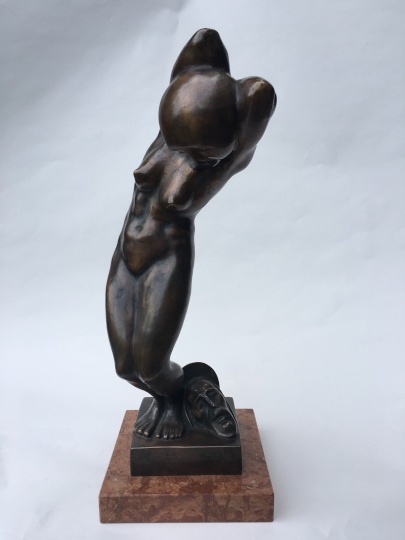 Gallas was fascinated by the connection between the art of sculpture and dance. He designed costumes and stage settings for his dance teacher wife and her students. His small sculpture titled "Grotesque dance" was the winner of the exhibition of the National Salon of Bukarest. Also in 1925, he won the plaque competition of the Temesvár Garden Society. He sculpted busts for numerous friends and fellow artists of Temesvár, such as Sabin Dragoi, Károly Endre, Else Kornis, Albert Varga, etc. In 1930 he became founding member and jury of the Bánsági Salon. He also taught periodically at the Art Institute of Temesvár. After 1934 he started working less, due to the strengthening of his illness caught in the war. He died in Lovrin in 1949.